The surviving paving of the forum is becoming ever more interesting. It only really survives in one corner, having been eroded from the rest of the plaza, so that only foundation fill levels are visible in most places, thrown into the rooms of the bath building buried below. Occasionally, the mortar survives without the paving slabs, perhaps with impressions of the stones used, which include some inscribed slabs which we are able to read in reverse. There has been some subsidence of the surface, probably because of the gradual compaction of the fill under the plaza. This may have necessitated a raising of the slabs in some places, as there does not seem to be mortar under all of them, and the mortar seems to dip down deep in places, below the actual paving. Repairs to the surface are also visible: areas of levelled small stones and roof tiles, perhaps patching up and a pot hole or marking the place where a slab was removed to access a drain or water pipe, probably in the 6th c. or later. There are lots of late Roman coins in this area, especially in the robbing level above the mortar, where slabs have been taken out for re-use in the medieval period. Interesting finds continue to turn up regularly. Green marble, pieces of a ceramic shop sign, gaming counters and lamp fragments have passed into the plastic bags recently. Perhaps the finest discovery was a slate writing tablet inscribed with Greek, only visible in glancing light. Perhaps it was the trace of a school located on the forum, as many were in this period. 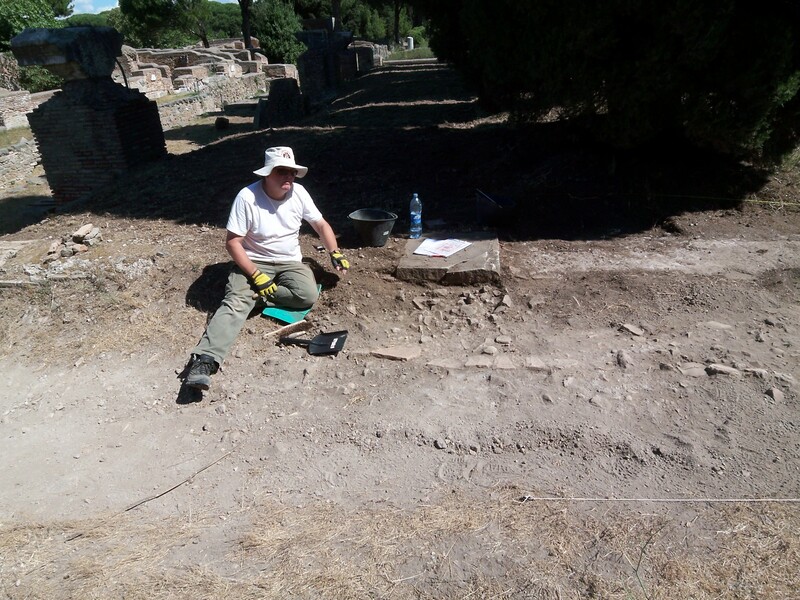 Now the finds processing is really advancing – as first supervisor Helen Harrington has taken direct control of the finds station: she cleared the backlog in a single day. 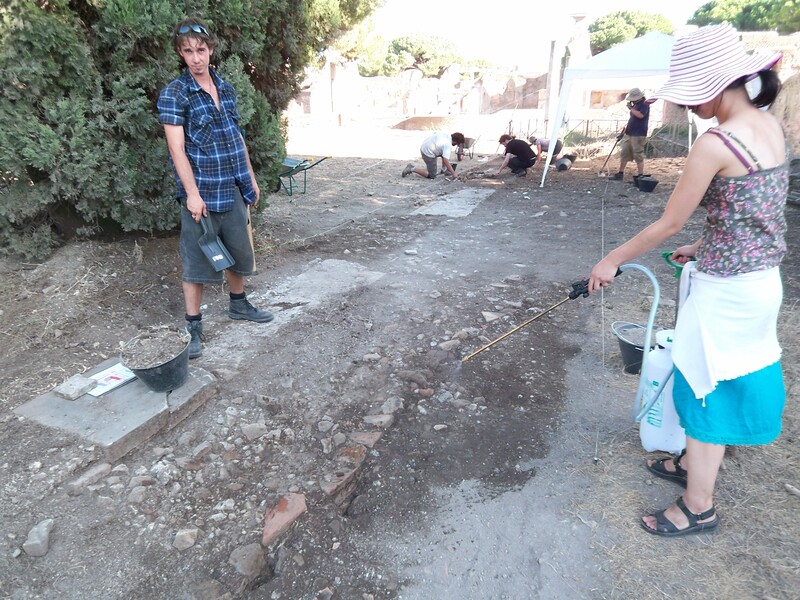 Volunteers have really made an impact on the dig, with trenches and sections neatly finished by Philipp Schmidt, Scott Craver and friends. However, the rest of the team is now very tired, the only comfort being the drop in temperatures that we have experienced in the past week. The air is now cool for most of the day, and even chilly in the late afternoon. The coldest workers are those with a talent for neatly labelling washed finds. They have to sit still all day in the wind and so are looking for autumn bonnets to keep their heads warm.